Rich The Caricaturist - One of the UK's finest Caricaturists (Check out his many five star References!) available UK WIDE to hire for weddings, private parties, corporate events, product launches and trade exhibition stands and much, much more! 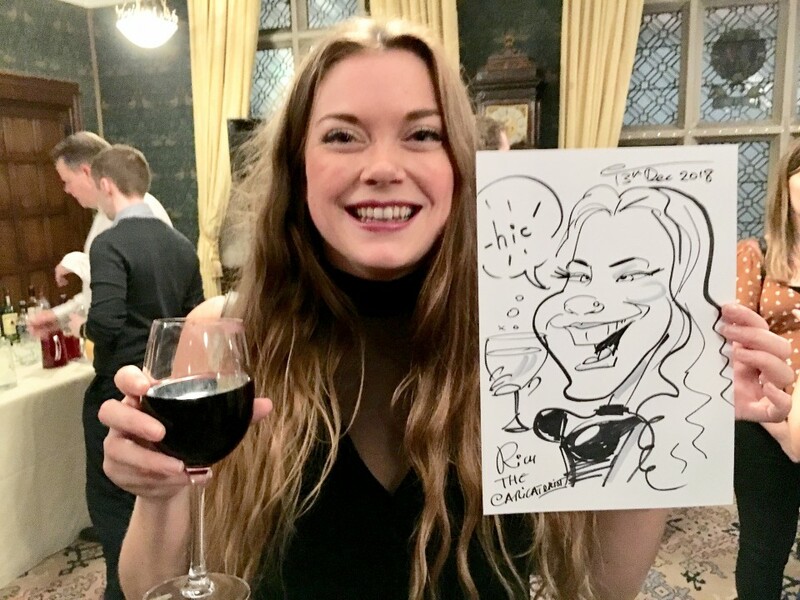 If you have a Wedding, Party, or any form of Corporate Exhibition, Event or Party, booking Rich the Caricaturist is a great way to impress your guests with entertainment that is lots of fun, exciting and different to what is usually seen at other events! 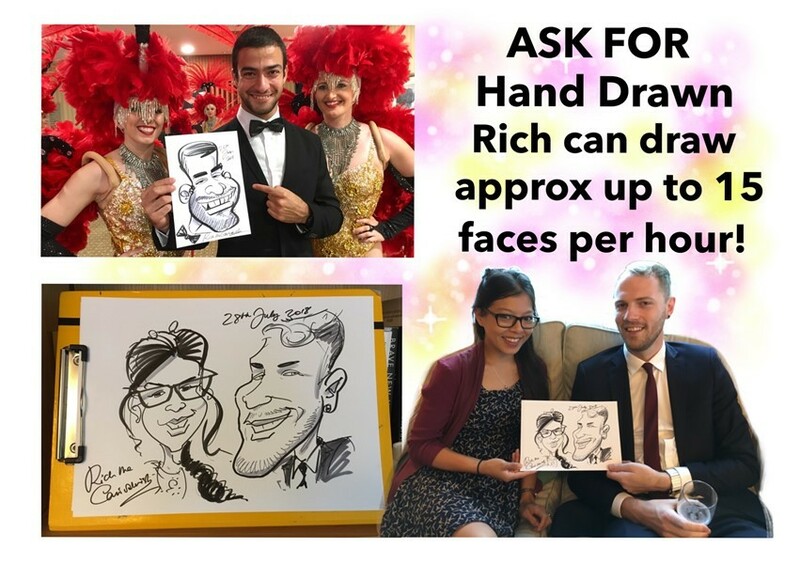 Rich takes a matter of minutes to draw a convincing likeness of your guests leaving them with a side splitting smile and a piece of original artwork of themselves to take home and treasure! Number of Reviews and Counting... 214! 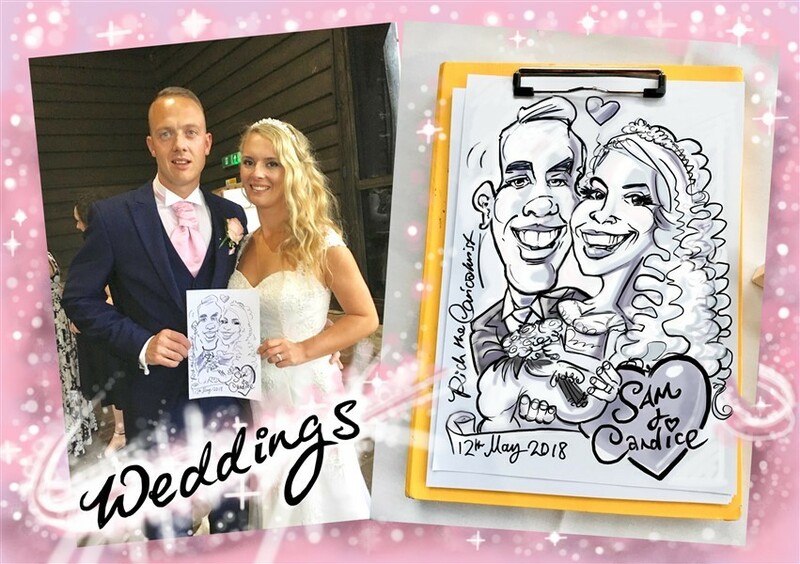 The caricatures Rich draws for your guests are normally hand drawn (best for normal sized Weddings, Corporate or Party Events up to 200 guests..) or why not try his NEW iPAD Experience? (A fun alternative for Corporate Trade Shows or smaller weddings, parties or gatherings with less than 80 guests). 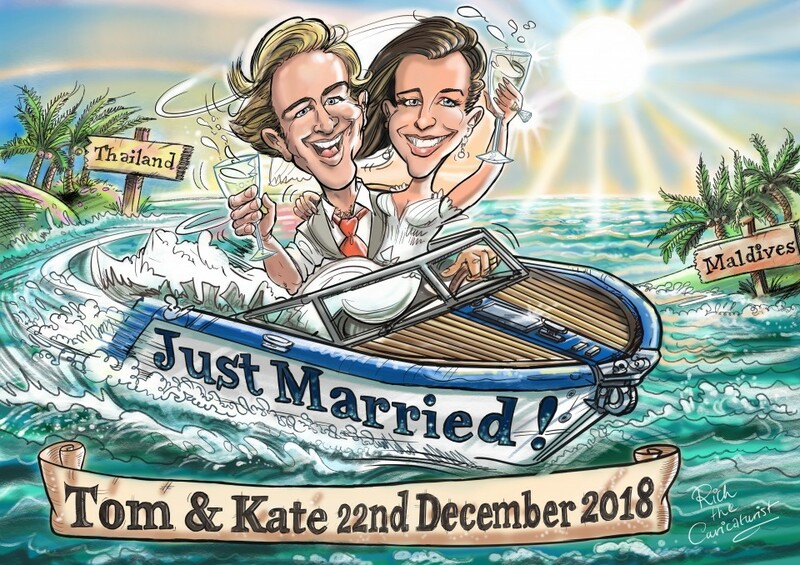 Hand drawn caricatures are usually A4 sized or A3 sized, simply very funny with sweeping black cartoon lines and presented to your guests on high quality paper in a clear plastic sleeve. Rich averages up to approx 15 faces as singles or couples per hour for hand drawn caricatures. So hand drawn is the best choice for normal sized parties of 10 to 200 people to create a fast flowing satisfaction for guests as Rich works the room! For more intimate gatherings where a faster pace is not as important... Rich has brand new FULL COLOUR iPAD EXPERIENCE (SEE PHOTOS GALLERY!) for simple walkabout entertainment (average rate is 8 to 10 faces per hour) Guests get the image emailed to them so a chance for Trade Show Sales and Marketing Executives to keep contact with prospective clients with your company logo placed on the digital images the clients receive either during the show or shortly after. Choose whichever service you want to book Rich to deliver - either hand drawing black and white caricatures on quality paper or full colour caricatures on an iPad. 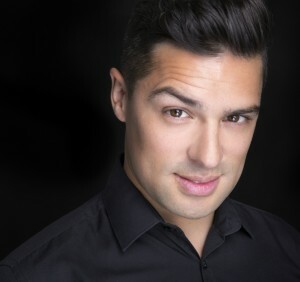 As you can see from his many five star References, Rich has entertained the most respected companies in the world and brought countless smiles to help Weddings and Party guests experience the entertainment they truly deserve. Rich can work on the iPad from a static position, at events such as trade shows, or mix and mingle where possible at smaller parties (MAX 80 people) or Weddings. Rich also has a "Lanyard I.D. Necklace Printer" so guests can have their image printed to walk round the trade show or party with the caricature hanging around their necks! (Ask your dedicated Warble Entertainment Coordinator for more details on anything they can help you with). Also, check out the pre-prepared artwork for any gift or that can be delivered to your wedding for your guests to sign! Given prior notice your company logo and web details etc. or for example wedding details can appear next to the caricatures on A4 sized pre-printed paper. 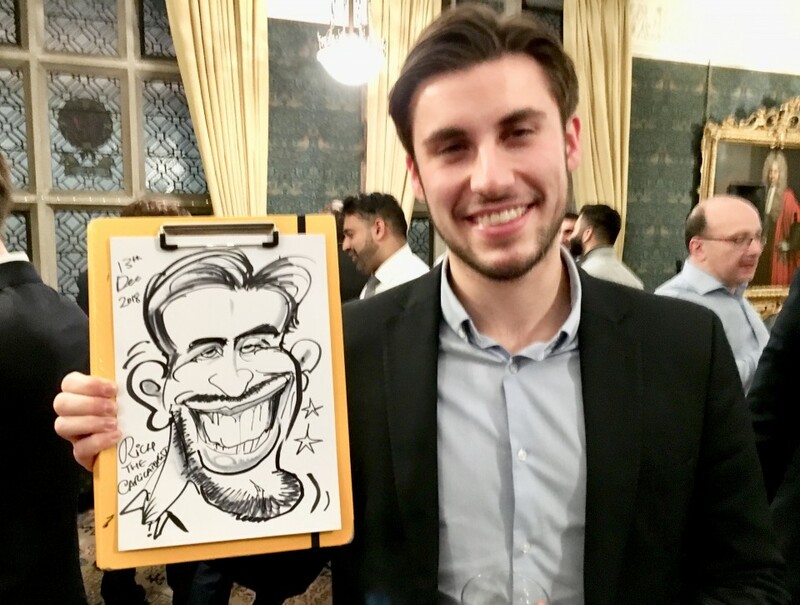 (Modest extra charges may apply) Caricatures are an excellent way to get everyone connecting at any events such as wedding receptions or at product launches to put a smile on the faces of clients you want to get interested in your products and services. 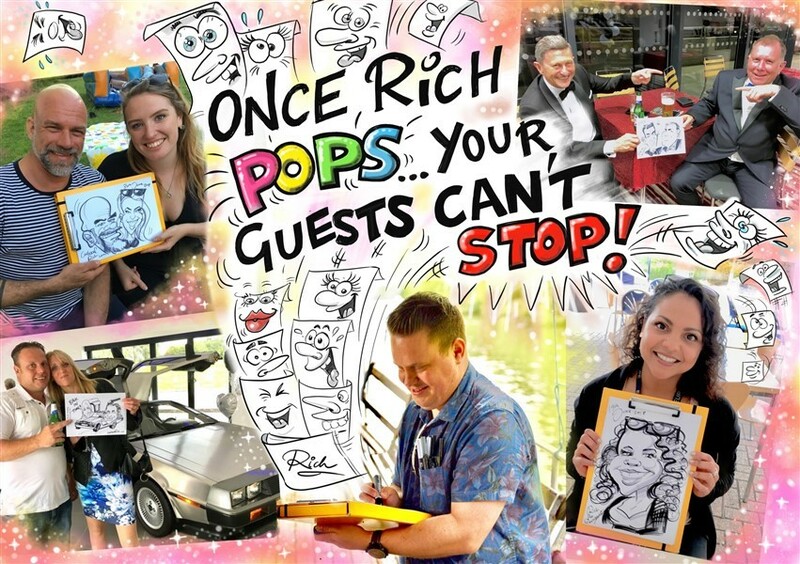 What better way to liven up your venue than to book Rich The Caricaturist? Arrived promptly, was friendly and courteous to all. Rich worked solidly for the entire booking and was a great hit with our guests. Would highly recommend. Rich was engaging, self sufficient and read each situation well. Rich was great, so friendly with everyone and the office dog. We would definitely hire him again. He has such a talent, not only with drawing but with the way he was with the staff. Thanks again. We have used Rich before and were delighted with his services again. Would highly recommend. Thank you Rich for entertaining the staff with your great talent! Utterly unique experience for guests, much enjoyed by all! Rich attended our corporate function and provided caricatures of everyone who attended. The feedback from everyone was great and everyone loved having a picture to take away with them. They have provided lots of entertainment in the office as everyone tries to work out who is who! Rich made contact with us in advance of the event and was happy to accommodate anything asked for. 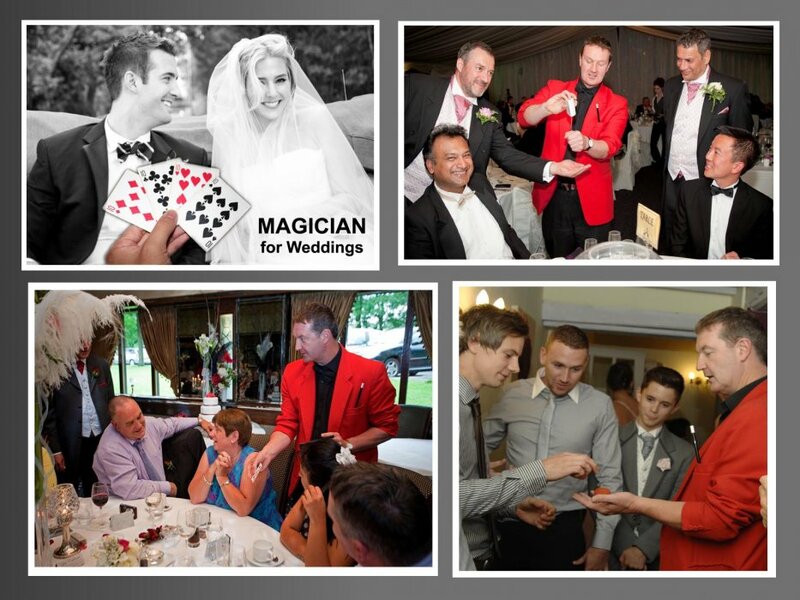 A great entertainer who is highly recommended for any event. Great fun, our wedding guests loved their pictures. Rich was brilliant. Friendly from the off; professional and fun; great artist. Highly recommend. Rich was absolutely brilliant in his professionalism and the way he interacted with our guests was brilliant. Everyone has thoroughly enjoyed the evening. Thank you for a lovely memorable evening. Just wanted to drop you a line to say you were brilliant on Friday and everyone really enjoyed having you there. You have a great talent and everyone was really pleased with your caricature pictures! Brilliant, friendly, very honest and guests loved him! Friendly, approachable, punctual & great with our guests. Was in demand and had time for everyone. 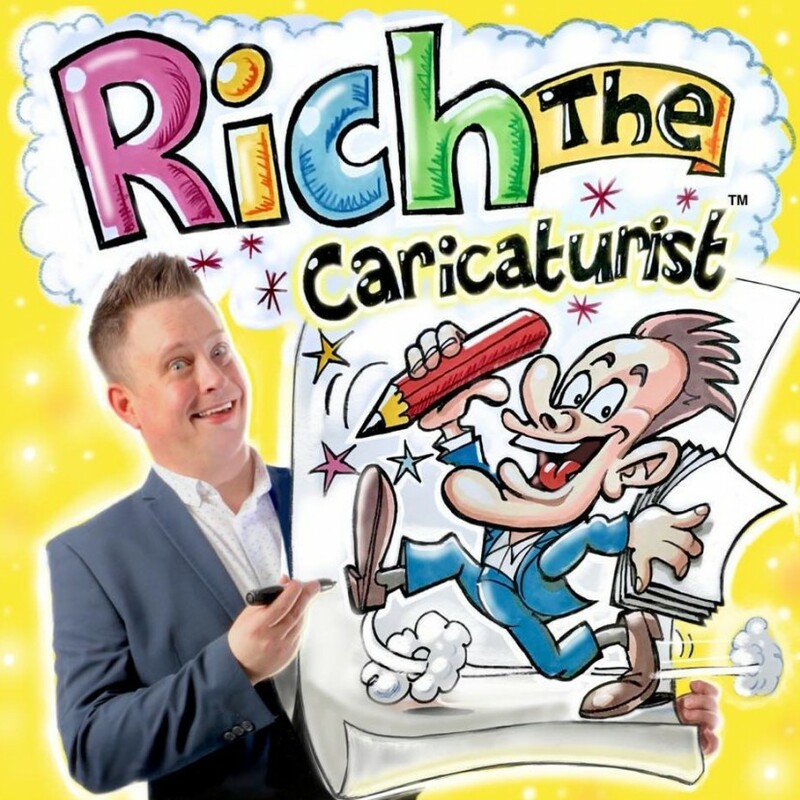 Great & funny caricatures and a very popular decision to book Richy. Rich was incredible! I received loads of amazing feedback from Rich and I spotted a couple of social posts put on. He really got the crowd interacted and impressed many! Thanks again, we will definitely be booking him again. He was amazing - so talented. He got round so many people, all my guests said how great he was. They were all laughing at how much the drawings looked like people. I would definitely recommend and would use again if I had another function he could be used at. Rich was excellent, good fun, very friendly and talented. Very talented man. He didn't stop from the time he arrived. Highly recommend for any event. Rich was excellent. The guests absolutely loved him and the caricatures were such a big talking point throughout the night. I'd definitely recommend him and if booking for a wedding, get the package that comes with a signing board. We'll be putting that up on our wall at home very soon. Thanks a lot Rich! The wedding picture was great and all the feedback from the guests was fantastic. Wow, Rich was amazing and our guests absolutely loved him! Rich was a huge hit. He was so friendly and the guests were queing to have one done. He got through all the guests that wanted it done and they were and we were really impressed with his pictures... they were so good and of likeness to the people. Recommend him highly. Rich was brilliant, guests loved his drawings and he continued to walk around tables for an hour once guests were seated to get a few more caricatures done - excellent. Rich was fantasic, very easy communication and was a real professional. Highly recommended. Rich was fantastic! He was so easy going and made everyone feel at ease. We all enjoyed the experience and Rich’s final montage was really above and beyond - thanks so much. Whole booking process and all communication was really easy and helpful. Would definitely recommend. Such a great addition to the event. 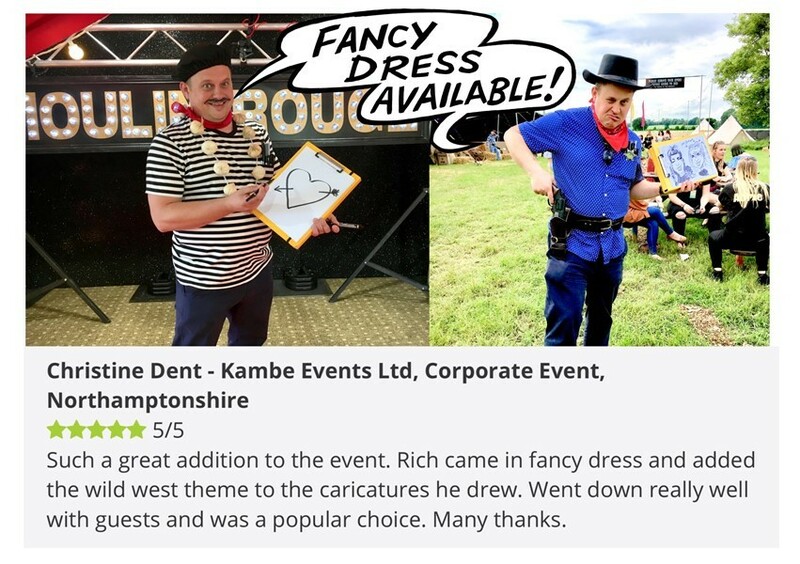 Rich came in fancy dress and added the wild west theme to the caricatures he drew. Went down really well with guests and was a popular choice. Many thanks. Rich did an absolutely amazing job at the party. Guests found it a fun activity and started to queue up to have their caricatures drawn. Rich mixed and mingled with the guests and drew quite a lot of guests, including groups of guests too. Guests were impressed by the drawings and it was a good takeaway keepsake - everyone leaving with fun memories from the party. I would definitely hire Rich again and recommend him to any event where you want to inject some fun with the guests. Thank you so much Rich. Great fun and enjoyed by all our guests. Rich made all our guests feel at ease and the caricaturists that he drew were excellent. Thank you Rich. Rich the Caricaturist attended a christening party for my two boys. He did excellent drawings of all the Godparents, Mother, Father and the boys and then created a superb collage of them all together. He added a great deal to the celebration on the day. A very talented caricaturist – we spent a great deal of time choosing one – he's also a very friendly person who added to the fun of the day. I can highly recommend Rich for a party. Was brill, would definitely recommend. Full marks for Rich The Caricaturist. Rich the Caricaturist was excellent, as a technical caricaturist and a personality on campus. We had Richard for the evening of our wedding and all of our guests loved it! A fantastic guy and brilliant at what he does! I would highly recommend him to anyone. Very happy, Arrived in good time and worked the room. Everyone was delighted with their pictures. If booking caricaturists, we would definitely book Rich again. Many thanks. Very happy with the act. Rich was great, he was already mingling with the crowd by the time I had chance to meet and speak to him. He worked wonders and the skills were shown in his art work. Everyone was pleased with their picture and he really captured some great features. Well worth booking as an additional touch to your event. All the guests at our event loved the caricatures and you interacted really easily with everyone there. Thank you very much! 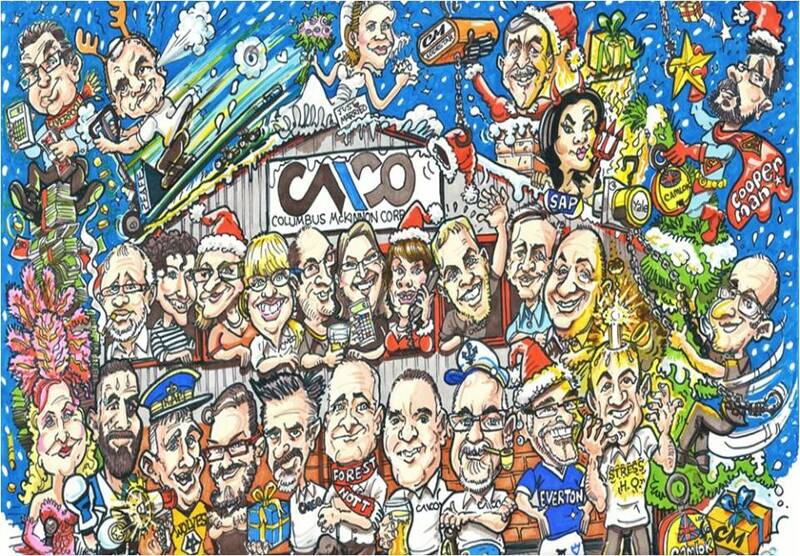 Brilliant caricatures and service by Rich The Caricaturist as always! Rich was excellent. He arrived on time, worked really hard and put people at their ease. He got the balance absolutely right between encouraging people to have the picture drawn but not being intrusive. Great value for money. Would most definitely book him again. Fantastic. Our guests loved Rich - he entertained them and gave them fantastic caricatures to go home with. Can't thank Rich enough! Rich was fantastic and all of our guests were delighted with his extremely talented creations!!! Rich was friendly, courteous and a delight to have at our wedding reception. I will be recommending him to everyone that will listen. The whole service from booking through to the event was First class. Thank you so much everyone! Rich The Caricaturist - Five out of five. Absolutely fantastic with the iPad - A very modern take. Rich arrived early, was super friendly and very enthusiastic. His drawings were super and everyone loved them! He was excellent, everyone thought he was excellent. Thank you very much. Great pictures, interacted well with our guests and great service. Many thanks. Rich was absolutely brilliant, and tailored his work to our specific requirements for the wedding. Everyone said how good the drawings were and many have already framed them, hanging up in their houses. We had Rich for around four hours, and must commend his stamina! Would certainly recommend to others. Thanks Rich! Rich was simply amazing and we couldn't recommend him highly enough. We thank him so much for helping make our wedding day so very special. Rich was a lovely guy, everyone really enjoyed his drawings. It made the day complete. Thank you very much, it was great. I hired Rich for my 40th birthday party and boy I'm so glad I did - he really did a fantastic job, excellent drawings and a great entertainer with the rest of my guests. I truly believe that Rich made a massive impact on my party - Facebook was alive with portraits the morning after! Loved it. Thanks Rich. Would definitely hire again for another party. Rich was professional before the event. He was on time for the event, well-dressed and prepared, friendly and funny. A lot of our group were nervous about having caricatures done but he put them at their ease! Excellent all round! Rich was fabulous at working the crowd and kept the atmosphere lively. Really pleased with everything. Thanks so much. Would definitely recommend. Rich was great to have around and our guests found his artwork very entertaining. We had some drama on the day that interrupted Rich's hours but he worked on longer and even completed the main drawing for us from photos later on. His kindness and willingness to help and go beyond his obligation to us were greatly appreciated. Rich was brilliant, and provided some great entertainment and laughter to the team during our boat trip, as well as them coming away with his amazing caricatures as memories! Highly recommended! Rich was brilliant, not only was he a fantastic artist which entertained everyone all night he has a great personality too - A***** THANK YOU! Rich was brilliant. His caricatures are spot on, he's friendly and funny, putting everyone at ease. I'm so glad that I chose him for my party, friends are thrilled with their keepsakes from the night. Rich was a great hit! He was polite, chatty and really helped create a great atmosphere! He was fast at the drawings, mingled continuously with all the guests and made everyone laugh with their images! This was a great alternative to a photo booth as he made it more personal and gave the guests a memorable experience! I would highly recommend Rich! Great guy and very talented! Thank you Rich! Excellent, really friendly and talented at his job. My guests were so impressed with their pictures, really recommend. Rich was excellent professional and every guest was thrilled with his work. Rich was brilliant! He went down really well with the guests. Very friendly and chatty. Absolutely great guy, mingled well with guests and everyone commented on how good the drawings were. Highly recommended, many thanks. Really pleased with the work and drawings Rich created. Everyone we spoke to was very impressed with him. Rich was fantastic in every way. Our mounted caricature was incredible, everybody raved about it. All our guests loved their individual caricatures and said how lovely Rich was. Rich was a true professional, his characuture drawings were amazing and all our evening guests were really impressed. Thank you Rich for making our wedding day really special. This is the second time we have booked Rich and once again he didn't disappoint! Guests loved having the pictures to take home at the end of a great party! Rich thank you so much for providing excellent service at my wedding. Our guests all thought you were so talented at what you do. It was a nice surprise for them they too! Will definitely recommend you. Thank you once again! Absolutely brilliant. Mingled with all the guests and made them feel at ease and important by having their own personalised portrait. Rich was fantastic at our event! He was extremely professional, polite and the guests were delighted with the images of themselves that they came away with. He's clearly extremely talented and would be a very entertaining addition to any event. Rich was very keen to please and his interaction with the guests and his obvious talent was one of the highlights of the night. I would definitely use him again. Very personable, followed our guidelines to draw specific people (award winners). Everyone loved their pictures and they were done really quickly. 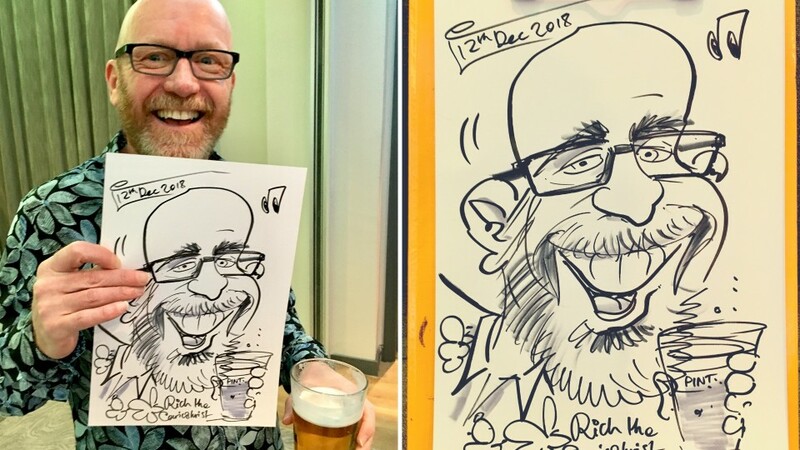 Rich is a fantastic caricaturist, we hired him for our office Christmas meal and everyone was pleased with their caricature, would definitely book again! Excellent, made a special 21st birthday party even better with Rich there, producing excellent drawings and making everyone laugh and enjoy. Thank you Rich.... Everyone had a fantastic time with lots of laughter at others expense. Our annual Christmas party was made extra special this year by booking Richard. What a hoot we all had as he captured us all in his excellent art work. The whole booking process was made easy by Warble who employ knowledgable, friendly and helpful staff. 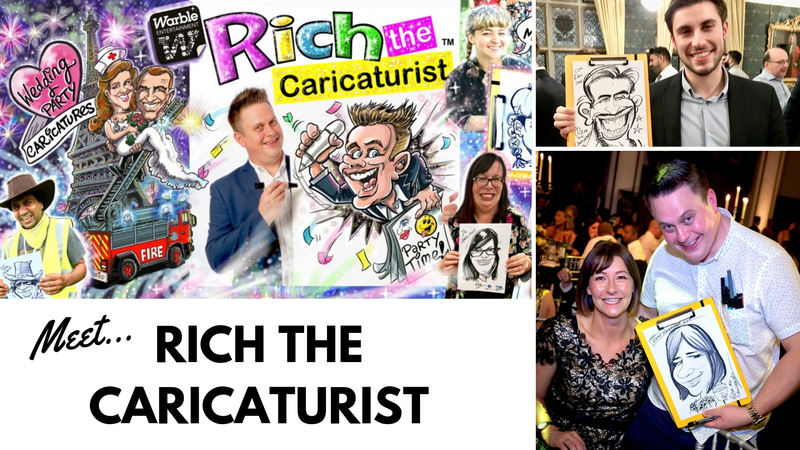 If you are looking for something just a little bit different for your next event, then I would highly recommend you book Rich the Caricaturist as your entertainment. No issues. Great guy. Thanks. Excellent. 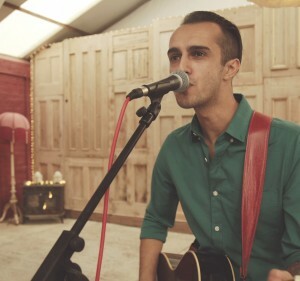 Lovely chap, brilliant talent, would definitely recommend. Fantastic caricaturist, friendly and helpful all night and helped me raise well over £500 for charity. Would recommend to anyone! Rich was an amazing addition to our big day. All the guests loved him and his drawings and everybody commented how original an idea it was. I would highly recommend Rich to anybody looking for something fun and different for their event. He arrived in plenty of time and after a couple of minutes sorting his pens he was off drawing our guests. He was very personable and very chatty with the guests. Again a 5* service that I would HIGHLY RECOMMEND. Our crowd really enjoyed Rich's drawings! OMG Rich's service was AMAZING!!! He arrived on time, was so polite and professional and was happy to fall in with everything and everyone. All our wedding guests were over the moon with the experience and he had to work solidly as his skills were in such high demand. Thank you and please send my grateful thanks to Rich. Rich was really friendly. He did a wonderful job of mine and my new husbands picture. Trying to combine autumn, star wars and rugby is a very difficult thing to ask but he did it and it looked amazing. Also all my guests were really pleased with their caricature. Thank you. I just wanted to give you some feedback as I was overwhelmed by the service I have just received. My company Beachcomber Tours booked Rich The Caricaturist for the day on Thursday 15th September. This was an important day as the start of our brochure launch and I was seeing my top clients and potential new ones, so could have been a make or break situation. Some of these clients ( travel agents ) are new agents to me and I have never met them before, so first impressions were very important. Rich was absolutely amazing both in his work and his professional manner. I can’t speak highly enough of him, he was a breath of fresh air and all my clients loved him. His work is outstanding and he knew exactly what I wanted. I couldn’t have asked for more – just fantastic!! Please could you pass on my thanks to Rich and if I get the opportunity again for any corporate events, travel agent functions etc I will contact you to re-book. 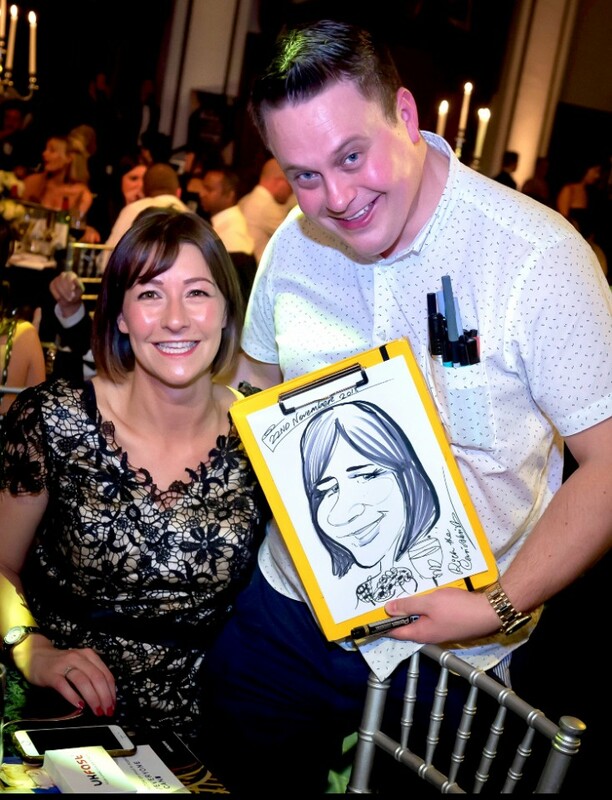 Absolutely loved our caricaturist, as did all our guests... very good value for money, as lots of our guests went away with their own caricatures of themselves... Would definitely recommend him. Rich was brilliant, interacted with staff and customers, nothing was to much trouble and his drawings were amazing. I would recommend anyone to book Rich, I look forward to working with Rich again. Please can you pass on this feedback to Rich and again a BIG thank you from everyone at Wolverhampton Audi. Rich has done a fantastic job with creating a leaving present for my colleague; helpful, prompt and courteous and I will definitely recommend him to others and use him again in the future. Excellent service from Niki who really helped choose the artist we wanted. Rich was fantastic! All the guests had lots of fun with him and his drawings were amazing! We have recommended Warble to others, excellent service and product all round, really happy. Rich's communication with me before the event was superb and he really took the time to understand our needs and produced a fantastic quality of artwork for my customers to take home from the Launch Event. Highly recommended. Rich was absolutely fantastic. Worked non-stop and really made everyone happy. He is so talented and it added more to the evening of our wedding having him there. Rich was engaging and very helpful. He kept us up to date throughout the whole process and produced some brilliant caricature place cards for our wedding. The place cards were the talk of the day and every guest loved their pictures. I can't recommend him enough! Rich was AMAZING. He came on time, was very thoughtful and made all the guests feel very welcome. He almost played the host! His talent was out of this world. He got around 30 guests and gave them all a drawing, he was very impressive. More over, he never stopped for over 2 hours and left the party with everyone on a high. I would without hesitation recommend Rich to anyone, he was outstanding and great value for money! Can't wait to hire him again. I just wanted to say a huge thank you for your caricature pictures on Friday night! The guests seemed very pleased with them. I hope you had an enjoyable evening. Thanks again. 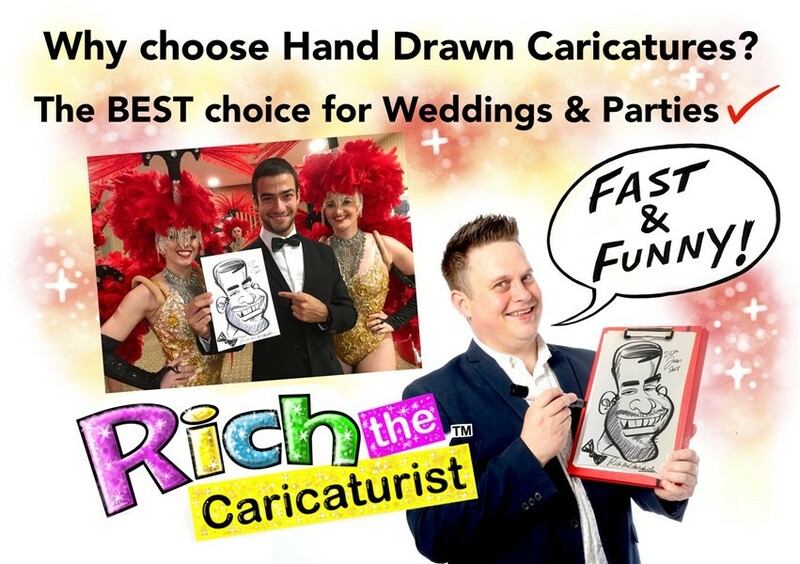 Rich is a brilliant caricaturist who offers a fantastic and speedy service. He really demonstrates a keen intent to meet his clients requirements, regularly checking his own work against his clients wishes. He is quick to implement minor amendments, but instantly captured the essence I was looking for. I highly recommend Rich for anything you might need him for. Fantastic! Great guy, Rich really is an expert at what he does! He went above and beyond to satisfy our guests at the awards night and the Pre-Drawn images were great. Fabulous images drawn and would use again for events! Thank you Rich! Rich was brilliant! Everyone loved him and his drawings. Rich is fun and engaging as well as being a talented caricaturist. Someone already wants to book him for her wedding! He works at an impressive rate and made sure everyone was satisfied before he left. Rich did a fantastic job. He of course brought a tremendous wealth of creative ideas to the project but also listened carefully to my ideas and particular requirements for the occasion and worked very hard to give great service as well as doing a super piece of artistry. We'd have no hesitation in hiring Rich again. Thank you! Fantastic addition to our awards party! Everyone really enjoyed having their caricature drawn! Would definitely hire Rich again! A great addition to our Christmas festivities. Rich was tremendous with the staff and they were so impressed with the quality of the drawings. I would highly recommend both Rich and his work to anyone. Rich was absolutely SUPERB! He arrived on time, if not slightly early and went down an absolute treat with our guests. He was fun, polite and approachable. The elderly guests thought he was super and so did the youngest of guests. 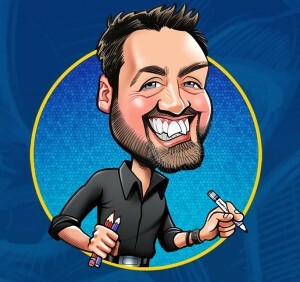 I would definitely recommend Rich to anyone who wishes to book a Caricaturist for their event. I will definitely be looking to book Rich again in the future... couldn't fault him or his work and simply can't compliment him enough! Everyone enjoyed the day and I believe Richard had a queue of people waiting for a drawing! 5/5, Rich was great, very professional and friendly - and most importantly very talented! Very prompt at email response too. Rich was great, he got round to everyone that wanted a caricature and felt like he was part of the party but stayed professional. Great bloke! Fantastic service and great with the kids. Lots of fun had by all. Rich was a really nice guy, the caricatures were excellent. Had everyone laughing. Definitely worth the money. Would not hesitate to recommend to others and would book him again. Very Friendly and polite manner. Rich was brilliant, I had so many comments on how he was a great addition to the day. Before the wedding he contacted me to arrange final details and to see if I had any special requirements. He arrived on time and got straight into mingling with guests and drawing groups of them, everyone loved the fact that they had a memento of the day to take away with them. 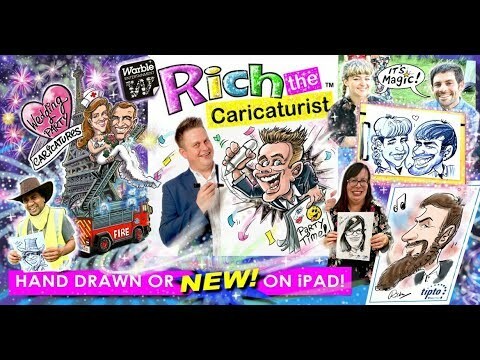 I'd definitely recommend Rich to others considering a caricaturist! We were delighted with Rich. He did an excellent job getting everyone involved and produced some wonderful pictures that made great presents for our wedding guests. He had to stay an extra hour due to the demand. Thoroughly recommend him. The booking process was easy and as for Rich, he entertained our party well and all our guests liked the pictures he produced for them - a very nice souvenir of the day. So many people commented on how great Rich was. I didn't get to see him much as he was too busy but he worked quickly and managed to fit so many people in. Everyone was showing off their drawings to each other and they provided a lot of laughs! He was professional and friendly and I've already had someone asking for his details for their wedding! Thank you so much to Rich and the Warble Entertainment team for making our wedding day that little bit extra special! He was brilliant, all the guests said how fab he was. I would definitely recommend him. Hi Rich, just wanted to drop you a note to say thanks for spending last night with us, my guys n’ gals absolutely loved you, they thought your drawings were fantastic and they have been floating around the office today with great delight. I can’t thank you enough and I won’t hesitate in recommending you to as many people as I can. Have a great weekend and thanks again. We had Rich come to our awards party. His drawings were fantastic and they were floating around the office the next day causing great delight. Rich was flexible throughout the night, he was very welcoming to our guests, who absolutely loved him. One thing I must mention is that his caricatures are very flattering, usually with caricatures they can be a little deflating for a person, no problems with this at all, Rich is very thoughtful in the way he draws. I cannot recommend Rich enough, hire him as soon as you can! I was performing at a 50th anniversary last night, also booked was Rich the Caricaturist - he was brilliant & everybody loved him. Fantastic!! True likeness on all the portraits. Had such a laugh whilst others having theirs done. Would defiantly recommend to family and friends. Thanks Rich. 5 stars. Superb entertainment and sociable. Everyone had a great night. Highly recommend! We were very pleased with the service we received from both Warble and Rich The Caricaturist. The caricature drawing was a gift and the recipient was truly chuffed with it. Thank you. Hello Rich, we would like to thank you for doing the caricature - everyone here at Golar have said it is brilliant. I would just like to say that Rich was brilliant on Saturday night, everyone loved what he did was very, very good, I would highly recommend him to anyone. Rich provided great entertainment at our wedding reception. Our guests loved this element of the evening and it's been a topic of conversation since! I highly recommend him. Everyone was very pleased with Rich's work - A fabulous addition to our Xmas party. I booked Rich for a corporate event organised for our client. Rich was outstanding and did an amazing job in avoiding any disruption to the party and discussions. His drawing were amazing and I would recommend him to anyone who is interested in booking a similar entertainer. Awesome..... do not hesitate to book this guy, our guests loved it!! Rich was amazing!! My guests absolutely loved his work. A great talented guy. Thank you so much! Rich lived up to all expectations. He was prompt, polite and interacted with the guests brilliantly. We loved his work and would recommend him without hesitation. Hi Annaliza, Rich was fantastic! He was very professional and really made the night for us and all of our guests, his work is top quality and he is a very friendly guy. Everybody loved their caricature that they got to take home and nothing was too much trouble for him. We'd highly recommend him to others. Rich was great and a fab addition to our event. He was friendly and made his 'subjects' feel at ease. All of the guests that had their picture drawn were clutching them tightly as the left the party! Rich was great, on time, put the guests at ease. His drawings hit the mark = would thoroughly recommend. We were very happy with Rich. Great guy, recommend any time. Big thank you. Rich did a superb job for us. He was very personable and really entertained our guests. His pictures were great and really funny. I would use Rich again and recommend him for other events. Rich was really great at our event. All the guests said wonderful things about the caricatures they took away with them. None were left on tables, and I think that spoke for itself as Rich managed to see everyone at the party! If we ever need some fun at a party, Rich will be the first person I think of. Thank you again Rich! Great caricatures, everyone loved them, Rich was very polite. We had an amazing night all the guests loved him. He was brilliant. So pleased we hired him. The guests commented on how good he was. He is very passionate about his work and gets things just so. I highly recommend him. Rich was fantastic. He arrived on time which is always a good start. Rich made everyone feel comfortable and at ease. His drawings were excellent, can not fault him. He gave our wedding a very special and personal touch. Thank you so much. Rich was absolutely brilliant. He did a fantastic drawing of myself and the groom for guests to sign. He was friendly and got lots of drawings done within the time. Guests were really pleased. Definitely recommend to others. Thank you so much, it added something really different to our day. Brilliant work by Rich, a lovely touch to our special day and he was very approachable and easy going! I would recommend highly! Rich was amazing really good artist made the night a real success great job! Not only talented but also unobtrusive and really good fun; perfect wedding surprise for my guests. Richard worked really hard and was kept busy all evening with lots of requests from our guests. Everyone seemed really pleased with the output and he certainly kept people entertained. Many thanks for helping us make the evening memorable. Rich was fantastic with the guests. Everyone was involved. Rich was great with both children and adults alike. I would honestly recommend Rich for any event. If we ever use a caricaturist again, which I am sure we will. I will be asking for Rich. Rich was great - everyone was really please with their caricatures and we will definitely book him again. Simply brilliant! My family and wedding guests loved Rich, top man made people feel at ease and some of the imagination used in the pics was superb! Book this Guy he is worth every penny. Thanks for helping making our day so special. We were extremely pleased with the service provide by Rich for our school function. He was professional, friendly and kept us all entertained. I would certainly recommend him to others and look forward to him visiting us again in the future. The day of our wedding was very snowy and quite a few guests and a hairdresser cancelled on us due to the conditions. However Rich went so far as to stay over the night before and stayed longer than we had booked him for so he could finish some sketches of the head table off. We really appreciated him being there and putting extra time in. He was a great addition to our day. Rich was superb - he started work very quickly when he arrived and didn't stop for the whole event, agreeing to stay longer than originally planned. He was in great demand and we have received many positive comments about his work since our event. We wouldn't hesitate to use him again if we were planning a suitable event. Rich was very professional, he turned up and went to work straight away moving through the room well making sure he went to every table. Everyone was delighted with their caricature. We would be happy to recommend. I was so happy with the service I received from Warble and Rich the Caricaturist. Coral, my Warble representative was very efficient and always got back to any queries I had quickly and in a friendly manner. On the night, Rich arrived promptly and was really enthusiastic to get going. The caricatures he drew were hilarious and feed back Ive got from the guests so far shows how much they appreciated his works of art. They made fantastic souvenirs of the event! Thanks again for being so friendly, helpful and organised, Warble really made planning an event smooth and easy! Many of my guests commented about how good Rich was and having him there certainly added to our event. Many thanks. Rich, was a star! He was asked to draw the most random images for an upcoming event, which he tackled with ease and they look great. Would definately recommend him to anyone. All very straight forward process booking wise. Richard was very good, the customers enjoyed him and he was certainly busy the whole time he was here. We would be glad to have him back again in the future. Rich arrived on time, was very personable and flexible with regard to handling requests. Would definitely use him again. We are so pleased that we decided to hire Rich for our wedding. The pictures were amazing and we had queues of people waiting to have pictures done. It was a great way to keep people entertained and to have a memento of the day. Rich arrived at our wedding with a smile on his face and a pocket full of pens! Throughout the evening he kept our guests entertained with his casual and humorous sense of humour. His drawings were excellent and he really picked up on people's features and personalities! It was a pleasure to have him at our special day and our guests loved him! I would definitely recommend him to anyone looking to add something a little different to their event! Top stuff! Rich was very professional and extremely entertaining for my bar relaunch event. He was at the venue on time, did not stop all night and also made conversation with customers. Highly recomended and would definitely book again. Rich was brilliant, on time, great with my guests and a real hit with all. Poor man had a queue and ended up putting in more time. I had guests come up to me right up till the end of the evening with their 'souvenir' all saying how impressed they were by him. He was brilliant and I would be happy to heartily recommend him to anyone! Rich was absolutely fantastic, we are so glad we decided to book a caricaturist for our LMC SU Festival and will definitely be booking him again!!! The students loved the pictures he was creating and I am even considering booking him for my wedding next year!! The pink bowtie was an added bonus!!! Hi Rich, I would like to thank you for being part of our Family Day. 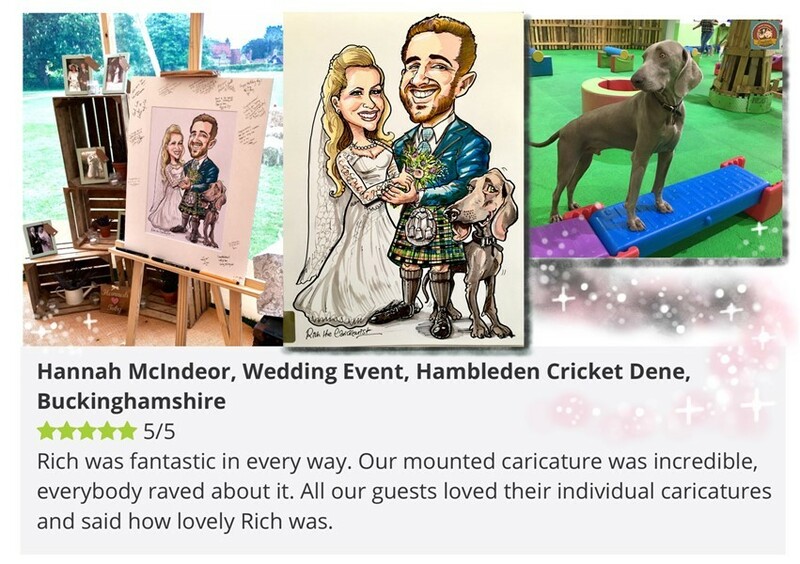 We’ve received very positive feedback on your caricatures – it was a great addition to the day and a nice memento for people to take away with them. As discussed I’ll pass your details & couple of example of your caricatures to JCB Marketing in case this is something they’d consider for their events/trade shows in the future. Many thanks again. Absolutely Brilliant. Rich arrived in good time and got stuck into drawing and mingling with the guests who enjoyed every picture and thought they were fantastic. We were extremely happy with Rich and his work on our wedding day. He will be highly reccomended by us to anyone that requires a caricaturist for any event. We would like to thank Rich and Warble for making our big day special. We were all really pleased with Rich. He was prompt and great fun. Absolutely fantastic!!! Far beter than the one we had last year! Lovely personality, the guests loved the fact that he went around the tables and they felt he put them at ease. He was a pleasure to have at the event and very professional and we will definately be booking him again next year! Many many thanks. We recently booked Rich for our wedding day, the day went fantastically well and Rich was a great hit! He moved from table to table and made our guests feel at ease when doing there pictures. He worked so hard for the full three hours and more, really funny guy who pulls the most funniest of faces lol. Most friends and family pictures now have pride and place on there walls :) We would definitely recommend Rich to all our friends. Rich was brilliant he went down a storm at the wedding and made everyone laugh, a very pleasant lad and very good at his job. He arrived on time and he did 2 excellent hours work and got to draw everyone who wanted to be drawn. Me and my wife are very pleased with the results. Thank you. Rich was fantastic he called me personally 2 days before the event to confirm the booking. He arrived on time and set himself up. He was a complete hit with the students who were forming lines to have their picture done. All the drawings were excellent and loved by all - considering most of the subjects were 16 year old girls with delicate egos - great achievement. If we ever need a caricaturist again we will definitely be booking Rich! Rich was a fantastic asset to our party-well received by all the guests. I would not hesitate to recemmend him. Hi Jennie, just to say that were really pleased with Rich who was at our son’s barmitzvah last night. He did a grand job and fitted in perfectly just as we wanted. He appealed to the adults and kids alike and seemed a really nice guy. Thanks again. Fantastic he made it a graet party... Everyone enjoyed it and his pictures were great! Thanks. Your service from start to finish has been excellent. The booking process was easy and uncomplicated. Rich The Caricaturist made the evening very special with his relaxed and friendly style. All our guests spoke very highly of him. I will not hesitate to recommend both him and your services to anyone I hear of requring entertajnment of any nature. Congratulations on a job well done....! We booked Rich for my Mum and Dad's 50th Wedding Anniversary party and RIch was fantastic; he drew great caricatures and drew to guests requests. He worked really hard for the whole of the 4 hours that he was booked going around everyone, fetching a crowd of onlookers. A big pat on the back for Rich. The booking process was easy and booked with ease; no quibbles at all; well done to all concerned!! Hi Marie, Rich was totally fantastic. He did everything we agreed and everybody thought he was amazing. Could you please pass this on to him for us both. Thank you to yourself also as you were very helpful. Hi Marie, just wanted to say a huge thank you to Richard for coming along to our party and providing us with his artwork. The caricatures are fantastic of the staff and they were a talking point of the night. It was a great way for staff to interact and the pictures are taking pride of place in our coffee shop for the whole of the company to see. Richard dressing up in French also set the Paris area off fantastically and he fitted in really well. Thank you. Hi Rich, Just wanted to say a huge thank you for coming to our party. Everyone one commented on how brilliant the caricatures were and they are taking pride of place in our coffee shop for the rest of the company to see. I hope all the staff were well behaved and im sorry I didn’t get to see you before you went. I hope you got home safely yesterday? Many Thanks. Rich was absolutley fantastic!! he really made our wedding reception just a little bit more special! Rich chatted to all our guests and made them all feel at ease and they haven't stopped talking about him! 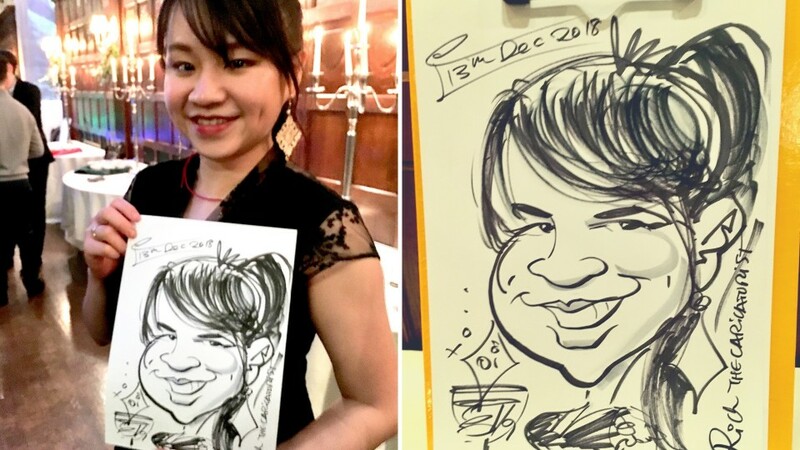 Everyone thought it was a brilliant idea to have a caricaturist at a wedding! 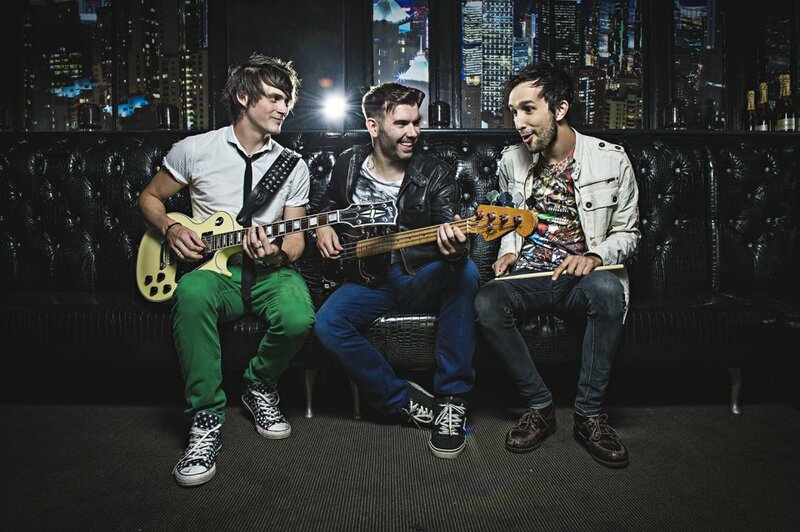 I would recommend Rich and Warble to anyone I know! Amazing!!! Was so much fun, everyone was so pleased with their drawings and have told everyone about the venue via txt and facebook! Rich made sure everyone was catered for and nothing was too much trouble. We will use again and recommend to our friends. Booking through Warble Entertainment was so easy and trouble free, many many thanks!!!! Hi Sam, Rich was fantastic and we would definately use him again. Warble entertainment were also very efficient and quick to respond to our enquiry considering we contacted to book on the Friday and the event was on the Sunday! Thank-you very much! Many thanks for attending our Xmas Dinner. We all agreed that your approach and interactive style worked very well for the occasion. Everyone was very impressed by the quality of the Caricatures and we shall be creating a montage for our business incorporating all of them. We wouldn't hesitate to recommend Rich and will indeed be inviting him back to other events that we will be holding during the forthcoming year. 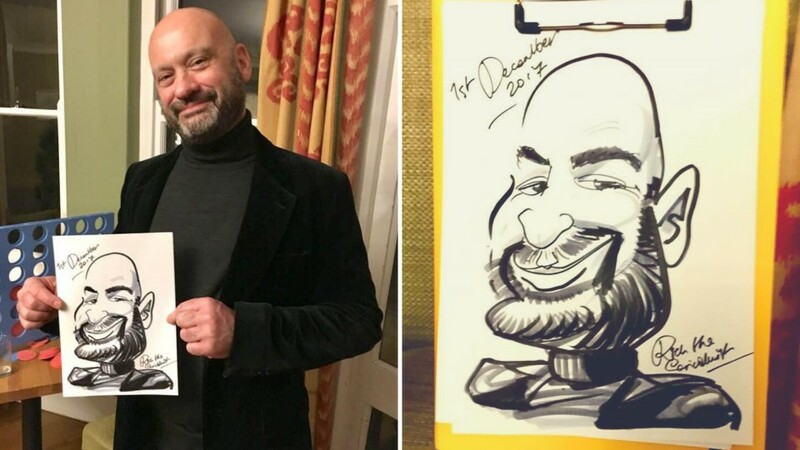 I received great feedback from all my guests... not only did they think it was great to have a caricaturist but that Richard was friendly and an extremely good artist and got everyone's good side! Thank you and would certainly recommend Rich for any event. Booking arrangements were good thanks - very efficient. Rich was great - well presented, prompt, worked very hard and very discreetly and provided really good value for money. Thanks - I will use Warble again. Hi Marie, I would just like to say how impressed I was with Rich. He was punctual and worked throughout the 3 hours we had him for. His drawings were fab and having Rich there added a bit of sparkle into the evening. As my party was fancy dress it was a lovely token for everyone to take away. The booking process was hassle free and Marie was always on hand with any queries I had and went that extra mile. 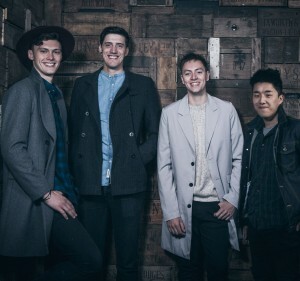 I would recommend Rich and Warble entertainment and will be using Warble for any future parties I have. Thanks Rich and Warble for an amazing party! The booking process was extremely efficient and Jennie handled all my emails swiftly as I needed the booking dealt with in a weeks time, as it was a last minute surprise for my husband to be. Rich was excellent through the evening and everyone loved having something a little different at the wedding. I couldn't recommend this service highly enough! Rich was fantastic. He was a great addition to our party. Both adults and children enjoyed having their caricatures done. There were still people wanting them done as he was leaving. I wish we booked him for longer. Very happy with Rich, I would use him again and recommend to others. Also very happy with the booking agency, you replied very quickly to my initial enquiry and any subsequent questions I had. The booking procedure was straight forward and the contracts were very clear and easy to understand. There was always a helpful friendly voice at the other end of the line whenever I needed to call you. Thank you very much for helping make our party a great success. Response time was brilliant and the price was very reasonable. Rich was very good, and did a great job at drawing everyone! 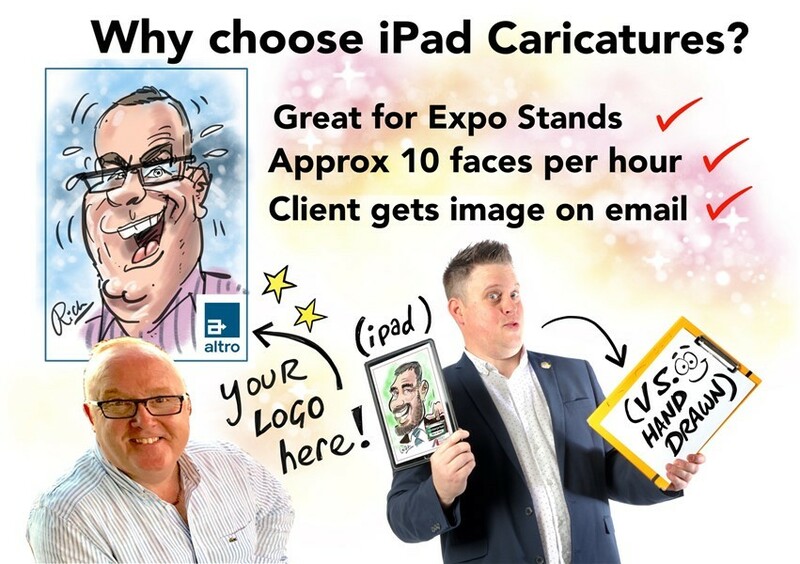 Ipad Caricatures are available for Events with 80 or Less and drawing approx 8 -10 guests per hour. This can be as a walkabout service shared as digital copies after the event or from a static postition even have them printed as necklace lanyards... I.D. clear plastic wallets with the caricatures printed and inserted into the wallets... ideal for Trade Stands looking to impress visitors! Available to hire by the hour starting with 2 hours minimum recommended. After the first two hours each hour is available at a discount price. Four hours is usually the maximum performance time. However, extended trade show and product launch pricing amongst other promotional activities is available. Customers who have enquired for Rich The Caricaturist for Parties and Weddings have also been interested in the following Caricature Artists. For more information or further options, please call 0845 643 9384.